A number of coaching farmer groups under Jakarta Maritime, Agriculture and Food Security Dept., succeeded in obtaining mentoring and aid of agricultural processing equipment.
" Alhamdulillah (thank God), Ramadan brings blessings. 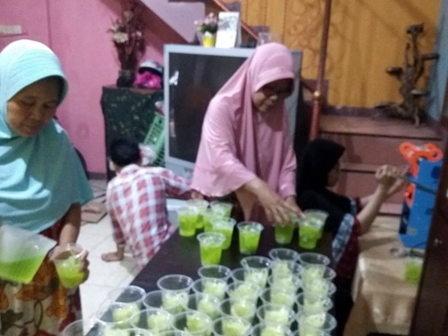 Every day we get orders for 250 glasses of fruit ice and kolak at the weekend"
One of farmer groups participated is Anggrek Farmer Group from Pasar Rebo Sub-district, East Jakarta that gets orders for hundreds of fruit ice glasses during Ramadan for Pasar Rebo RSUD. "Alhamdulillah (thank God), Ramadan brings blessings. Every day we get orders for 250 glasses of fruit ice and kolak at the weekend," expressed Yuniarti, Chairwoman of Pasar Rebo Anggrek Farmer Group, Monday (5/21). The same success is also experienced by Lestari Farmer Group from Mampang Sub-district, South Jakarta. Lestari Farmer Group Chairwoman, Lasmi claimed able to increase earnings after her group got help from agricultural processing equipment from the Maritime, Agriculture and Food Security Dept. "During Ramadan, I always set up bazaar in JCC, and get an order of herbal medicine for Asean Games guests drink," she told. Jakarta Maritime, Agriculture and Food Security Dept. Head, Darjamuni uttered, so far, there are 205 farmer groups registered in OK OCE program. There are still many groups that have successfully increased their earnings after receiving the help of processing equipment. "We're so grateful for what we have given benefit to farmer groups and people," he said.